There are some parts you just don’t see on custom bikes nowadays. 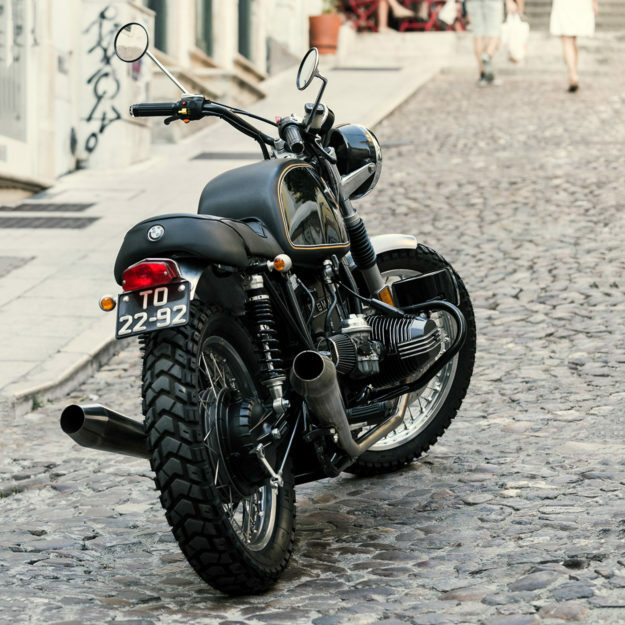 Like mirrors, center stands, fork reflectors, and—heck—even fenders. They all end up in the bin faster than you can order a roll of pipewrap. 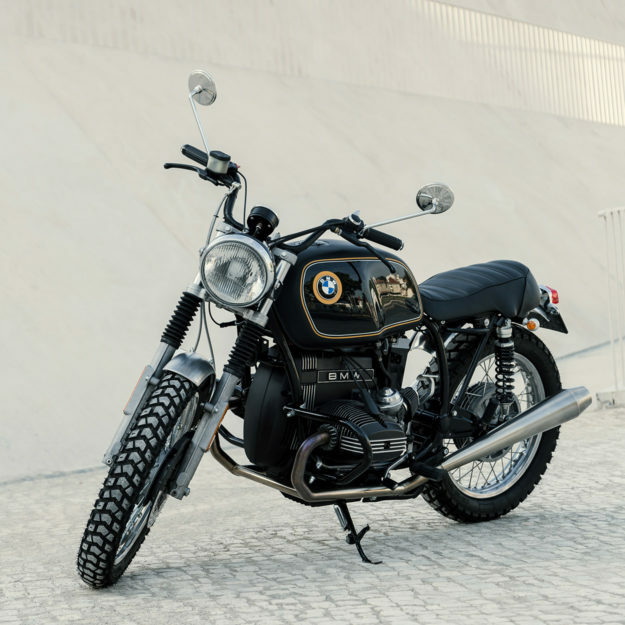 But this restomod BMW R65 has all of those things—plus decent sized lights, touring handlebars and a cushy seat. And with orange highlights inspired by a late 60s BMW Alpina car, it looks incredible. 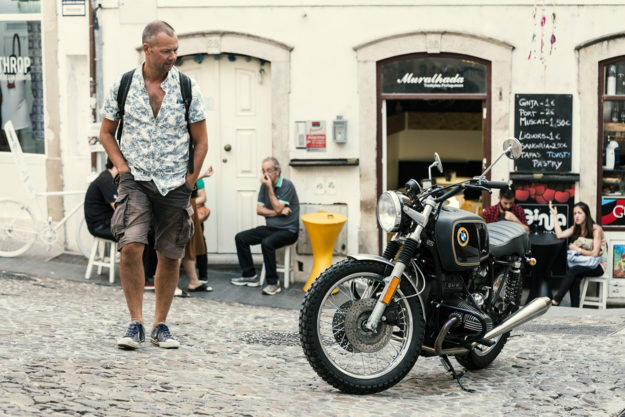 The man with immaculate taste is Pedro Pires, who calls his Beemer ‘Scrambler Alpina.’ Pedro sourced the 82-model boxer from Rotterdam, and had it sent over to Coimbra, Portugal, where he lives. Pedro needed someone to do the heavy lifting, so he contacted fellow Coimbra local João Barranca of Redonda Motors. Between them, they’ve proven that usability and visual appeal can co-exist, happily. 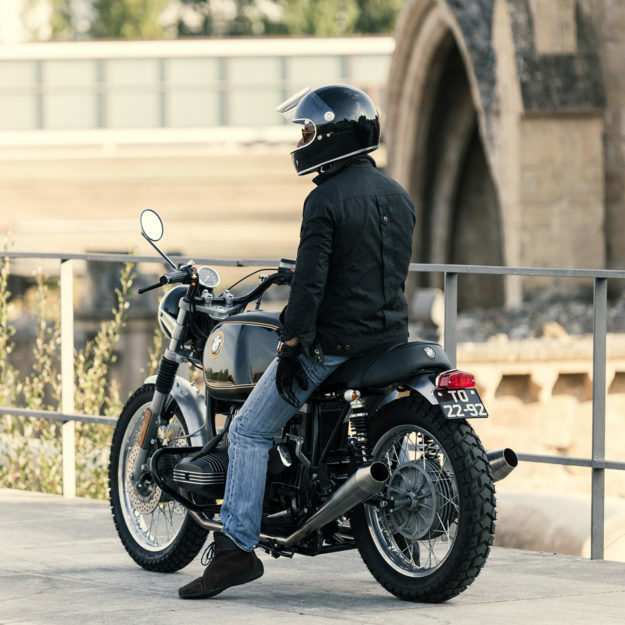 The R65’s stock fuel tank, wheels and original Krauser panniers were the first items to go. On went a bigger R80 tank, a new fuel cap and a pair of switches. 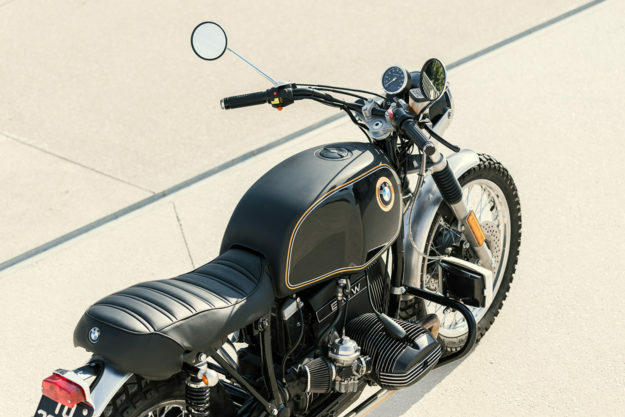 Pedro decided to keep the R65’s comfortable touring handlebars—but he’s had them refinished in black. The cockpit is now sprinkled with Motogadget bits: a new speedo, grips and bar-end blinkers. The laced wheels are refurbished items from a 70s-model boxer. 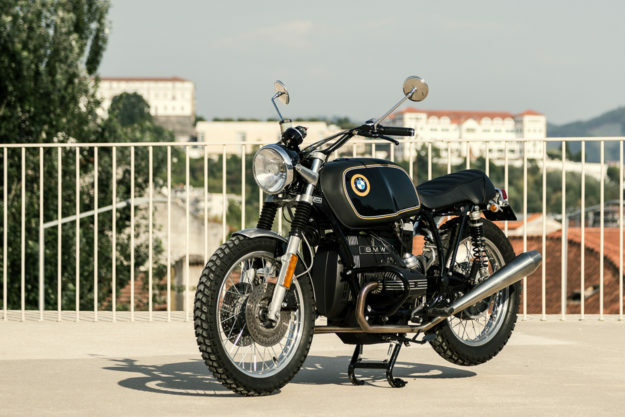 They’re wrapped in dual sport tires from Heidenau—so the BMW is just as happy bumbling along fire roads as on the street. 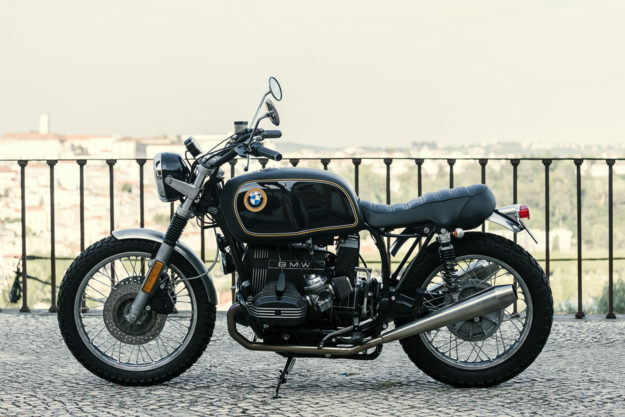 Out back is a custom-made subframe, and a well-padded seat that will be good for more than just runs to the local barzinho. Lighter and better-looking alloy fenders replace the stock units. New rear shocks tighten up the handling, and there’s a Brembo double disc brake up front to stop things getting out of hand. The airbox is gone, with the battery bumped forward to occupy the open space left behind. K&N filters and a custom stainless steel exhaust system keep the bike breathing (and sounding) great. Pedro’s ‘Alpina’ livery has been executed beautifully, with a mix of matte and gloss finishes. 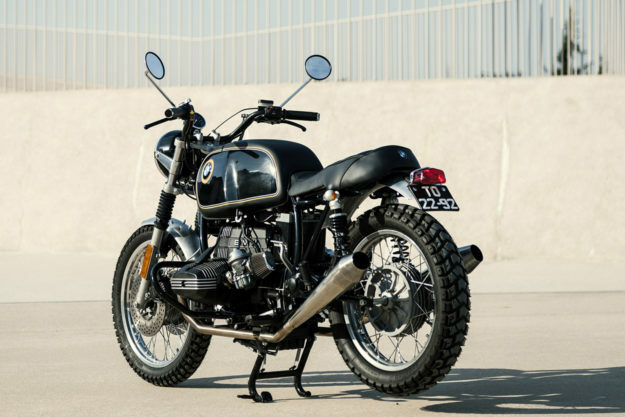 We love the tasteful details throughout the build: the neat little BMW roundel in the back of the seat, the Lucas-style rear tail light, and the SEV Marchal fog light, mounted to the right crash bar. Look closely, and you’ll even spot the original left-side grab handle—an invaluable tool for getting old Beemers onto their center stands. 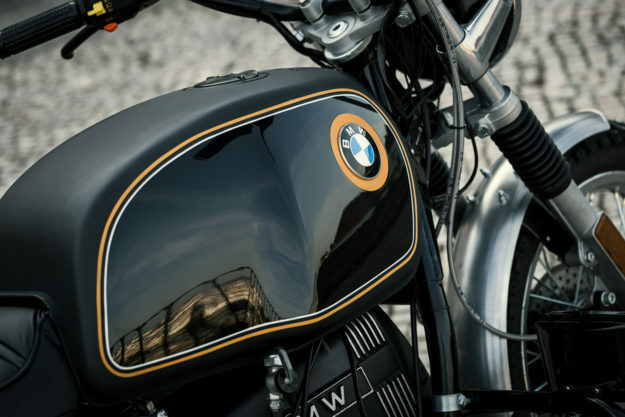 This BMW restomod might not be genre bending, outrageous or off-the-wall. But it’s charming and thoroughly practical. And good enough to turn heads in any European city, let alone Coimbra.